Brandon Clark and Don Hopkins give globally inspired thrills to heat-seeking foodies. There's nothing like hot chili pepper sauce to pleasurably jolt the senses, and we love a good variation on the classic elixir. Brandon Clark and Don Hopkins' globally inspired set includes five original sauces that will get pepper-lovers' tastebuds humming, in different languages and accents. Each distinct flavor profile is inspired by the cuisine of a different region. Whether you like your heat treatment earthy, tangy, herbal, floral, sour, savory, or aromatic—or an all-of-the-above blend—you'll be transported by these sense-sational arrivals on the hot sauce scene. Made in Virginia. Packed in North Carolina. Chesapeake Bay: Mildly (though noticeably) hot green sauce with zesty, herbal/floral notes. Wonderful with eggs, proteins, vegetables, french fries, and cocktails like the Bloody Mary. Try a little in your salsa or guacamole. Kerala: Created for a friend from southern India, this deliciously scented sauce blends habañeros and jalapeños with typical regional ingredients like Kashmiri chili powder. Delicious with any protein or vegetable (especially Indian dal), as a marinade, to enhance rice, and with coconut milk for a quick curry to top eggs or tacos. Ethiopia: Earthy, fragrant heat from habañeros, jalapeños, and berbere, an unforgettably aromatic regional curry blend. Goes with lentils, grilled protein, rice and potatoes, quinoa, and cooked leafy greens like cabbage, collards, and kale. Assam: Named for the Northeast Indian state known to chili fanatics as the birthplace of the intensely hot ghost pepper. Naturally it contains some, as well as the 7 Pot Primo, a newish, ultra-hot pepper that's still somewhat rare. It's full of the fruity/floral and sweet/sour flavors typical of this region. Virginia: Inspired by an 1850s Virginia BBQ recipe, this addictively tangy delight blends in Southern goodness like peaches, peanuts, and rye whiskey. Divine with grilled food (try it on fruit! ), cornbread, eggs, and bean dishes. It all started on the tennis courts of Northern Virginia when chef Brandon Clark was challenged by a tennis buddy. Buddy Brijesh was from southern India, and he challenged Brandon to create a hot sauce using the ingredients of Kerala, a region rich in indigenous spices. The result was so impressive that Brijesh exclaimed, "This tastes like home!" Brandon and his Partner in Sauce Don Hopkins continue to experiment with flavors from Southeast Asia to the US, and everywhere in between. "We study cuisines of the world to bring you an authentic culinary experience," Brandon says, "using 100% all-natural and gluten-free ingredients." 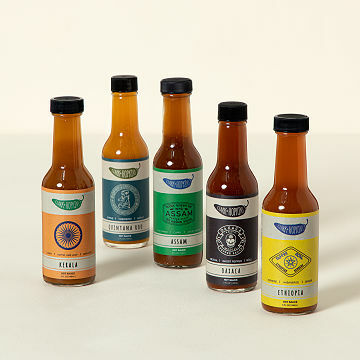 We use the sauces for a variety of thingsâ€”perfect package for a hot sauce lover. The worldwide variation adds a nice touch to the novelty of the gift! This collection of hot sauces from around the world made a great Christmas gift for my son, who loves hot sauce on his food. This gift was perfect for my cousin (who has everything she needs) who loves hot sauce to get to try high quality different global options! My son lives in Austin, TX and searches for the best hot sauces from around the world. This caught my eye because of the Ethiopian variety. I lived in Ethiopia for 2 years in the 1970's. Thought he would enjoy seeing what the food was like where his parents lived at one time. Absolutely delicious, every time I eat tacos out I am wishing I had a bottle of Kerala in my purse!! I crave it. I find myself making breakfast burritos or tacos much more now all because I want Kerala. Each sauce has unique flavors that pair well with different meats, rice, eggs...ok basically everything! These sauces are NOT a burn your tongue off and thats all there is to it kind of hot sauce-- they have delicious flavor, spice, and each a different level of heat. The gift box and bottles all come in eye catching packaging that makes you want to keep the bottles even after you finish off the sauce. You won't be disappointed! These are so much more than the typical hot sauce. They are excellent to cook with and the variety is great, it is like visiting other countries but in your own kitchen. Try them with grilled chicken, with hamburgers (add chunks of cheddar cheese...yum), on top of scrambled eggs, spice up your shrimp and grits with the etheopian spice. Love to make indian style fajitas and try the Bloody Mary mix it's great! We have a dinner party coming up that will be grill oriented. This will be perfect, simple and exotic...easy way to impress our guests! I hear they have more countries and regions coming soon. These sauces are full of flavor and far more than just a condiment. Excellent base for a veggie Curry dish when combined with coconut milk. Fantastic! Loved them so much that I had to get a set for myself.